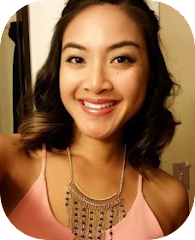 I never knew the Chevron Infinity Scarf would be such a great hit! Someone brilliantly suggested a pattern for a matching beanie. So here we are. 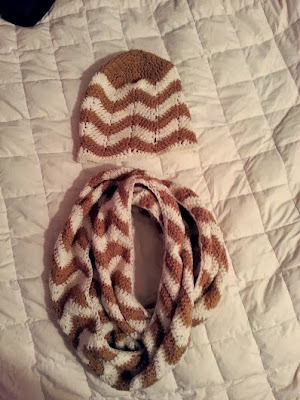 Stay tuned for matching chevron boot cuffs as well! 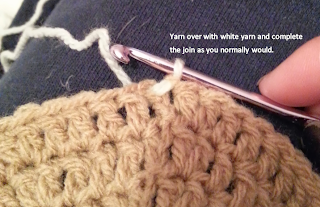 The beanie measures 10 inches long and about 9 inches wide. After making this beanie, I found it was a little tight on me. If I were to make this beanie in the future with the same type of yarn (3), I would use an H crochet hook instead. Or I would use a G hook with worsted weight (4) yarn instead. The ch 3 counts as a dc throughout the pattern. I carried the colors on the inside of the beanie. It's a lot easier than fastening off each time, and it's on the inside so it won't be seen. I included pictures on how I did the color change below. With [A], make a magic circle and ch 3 (counts as dc). Make 9 dc in the circle. Sl st in the top of the beginning ch 3 to join. Ch 3. Dc in next 4 dc. *2 dc in next dc. Dc in each of the next 5 dc. * Repeat from * to *, ending on 2 dc in last dc (70 dc). Switch to [B] when joining with the ch 3. Then, ch 3 to start the next round (see pictures). 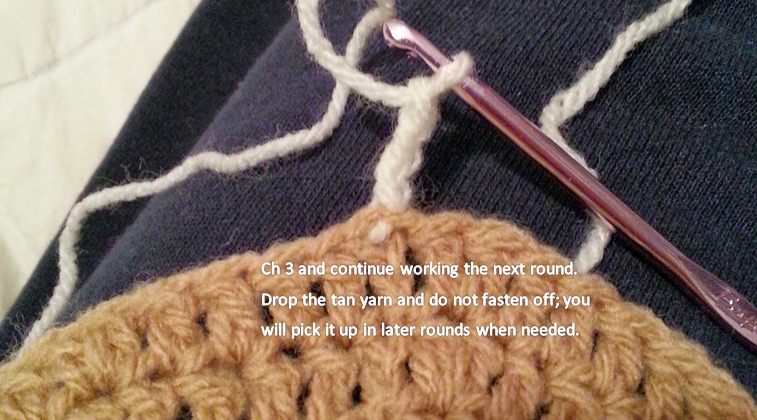 When you need the tan yarn again, you can pick it up right where you left it and change colors using the same technique as in the pictures each time. 2 dc in same space as join. *Dc in next 3 dc. (dc3tog in next 3 dc) twice. Dc in next 3 dc. (3 dc in next dc) twice*. Repeat from * to *, ending with 3 dc in the last dc. Sl st in top of ch 3 to join. Ch 3. Repeat Round 7 eleven more times, alternating with [A] and [B] every 2 rows for a total of 6 stripes. When finished with Row 11, sl st in top of ch 3 to join. Ch 1. 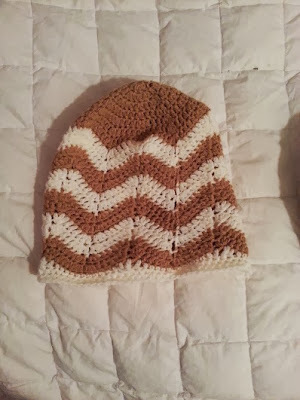 This part of the beanie fills in the bottom of the chevron pattern. Sc in next 5 st. [hdc, dc, tc, dc, hdc] in the next 5 st. *Sc in next 8 st. [hdc, dc, tc, dc, hdc] in next 5 st.* Repeat from * to *, ending in sc in the last 5 st. Join with beginning ch 1 to join. Ch 1. Sc in next 5 sc. *Hdc in next 5 st. Sc in next 8 sc. * Repeat from * to *, ending on sc in last 5 sc. Sl st in beginning ch 1 to join. Ch 2. Hdc in each st around. Sl st with beginning ch 2 to join. If you want a longer/thicker brim, repeat Round 3. Please feel free to ask questions in the comments if anything is unclear, I'm happy to try to help! 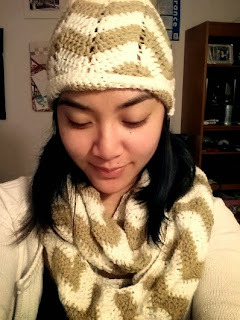 I made your hat in St. Patrick's Day colors and posted a link to your pattern from my blog. 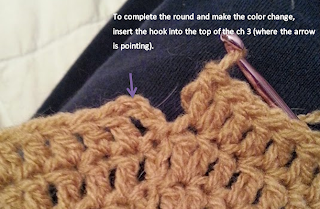 Here's my post...http://www.doodlesandstitches.com/2014/02/how-to-crochet-four-leaf-clover.html Thanks for the pattern, it's adorable! Can u plz make video out of this??? 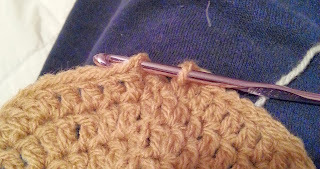 I'm sorry, unfortunately, I'm not making videos of my patterns at this time. Please let me know if I can explain anything to help or send you pictures. You're welcome. I'm so glad you enjoyed my other boot cuff pattern. Hope your chevron hat turned out well! I have a draft of the chevron boot cuffs written out, but I haven't executed it yet. I've been incredibly busy and haven't had a chance to blog much. Hopefully this winter I'll have some more patterns to share. Thanks for the lovely comment. 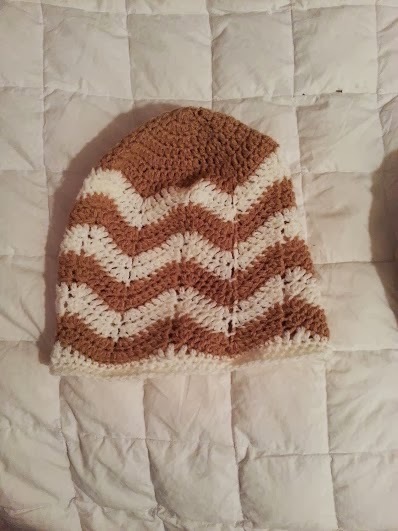 I have made the Chevron hat. All the stitches worked well..thank you. My problem is that where the crown meets the pattern, the decrease dc forms peaks that stick out. Will those disappear when I wash and block it?